Newer. Bigger. Faster. More Spacious. Meet the Victoria Clipper V! Just in time for planning that spring escape, the newest member of our fleet is an impressive 170 feet long (52-meters) and currently configured to hold 440 passengers (max capacity 579 passengers) and can cruise at up to 36 knots (nautical miles per hour). And that’s just the beginning. On board, I experienced the unique variety of spacious walking areas surrounding the colorful, luxury seating, which gives this large vessel charm, warmth and the feeling of relaxation. Food and drink service areas are as plentiful as the large windows at every turn. Fabulous! Your next cruise between Seattle and Victoria just got even more extraordinary. 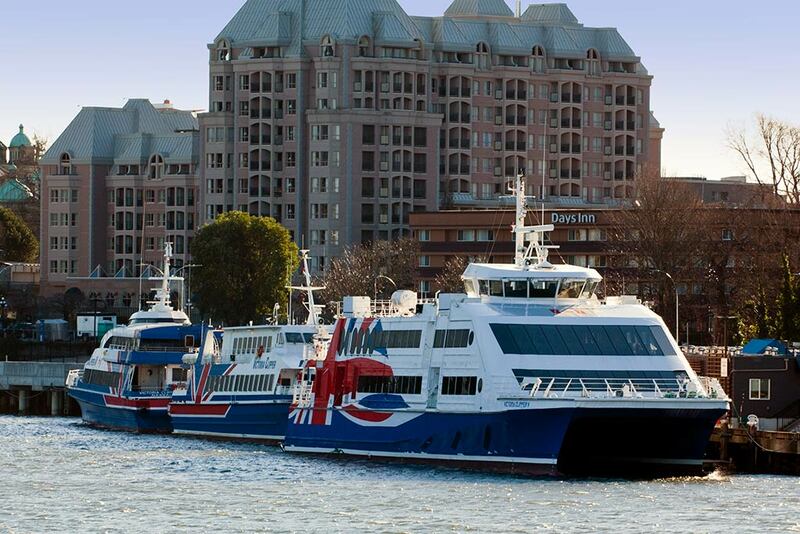 Climb onboard and discover 10 reasons why you should experience the new Victoria Clipper V! Brand new to Clipper is Comfort Class, our version of business class. Be the first to hop on the boat and delight in early access to your seats with priority boarding. Settle into one of 76 leather seats encircled by large windows in a spacious private cabin area on the upper deck. The best part? Upgrading to these primo seats is only $25 USD more per leg of travel! Snack on a number of complimentary goodies, such as seasonal fruit, pretzels, trail mix and non-salted almonds. Quench your thirst with Coca-Cola products, still and sparkling water. When you’re ready for dessert, there are Biscoff cookies to pair with your Café Vita coffee and Rishi Tea. Yum! Let’s be honest, there is nothing better than warming up with a local coffee roast, a frothy latte foamed to perfection or a punchy double espresso. If you forgot to grab your morning cup of joe from the Clipper Café or are in desperate need of a refill mid-ride, Comfort Class passengers can head over to the complimentary espresso machine and whip up a cappuccino, latte, macchiato or espresso to fulfill your caffeine fix. With large, panoramic windows at the front and either side of the vessel, there are outstanding ocean vistas nearly everywhere you look. Even as a local familiar with the sights of the Pacific Northwest, it’s hard not to get into a staring contest with Mother Nature’s display of Salish Sea views and snow-capped mountains on either side of the route between Seattle and Victoria. Unlike a cramped airline flight or shoulder-to-shoulder bus ride, the Victoria Clipper V’s spacious, light-filled interior and wide walkways provide an irresistible sense of freedom and relaxation. The boat is yours to explore, with seating on both the upper and lower decks, multiple sun decks as well as an onboard gift and a galley complete with a fully stocked bar. For families or groups who need a little space to spread out, there is table seating where you can play cards or share photos to pass the time. Should hunger strike, order up a selection of locally-sourced and freshly prepared meals, including Northwest favorites such as handmade sandwiches on Macrina Bakery bread, Ellenos Real Greek Yogurt parfaits, smoked, wild-caught salmon and Theo’s Chocolates. Feeling extra fancy? Marry your meal with a mimosa or a handcrafted cocktail produced with locally-distilled spirits such as Copperworks vodka and gin or Mischief bourbon. It’s easy to spend the quick, less than three-hour journey between Seattle and Victoria cozied up in your seats, but don’t miss the opportunity to wander out to upper, outside deck. With the powerful streams of water rooster tailing behind the vessel from the waterjets, the views back at the city of Seattle are absolutely breathtaking. There is no better way to start or end an adventure than to cozy up in your reclining seat, kick back and relax. Curl up with a good book or check out that movie you’ve been meaning to watch. Just don’t forget to look up every once and a while to stare out at the natural beauty that surrounds you. Not sure what to do in town? Leave the activity planning to us. Our 31 years of vast local expertise allow us to offer suggestions for a curated getaway you won’t forget. From recommendations on where to find legendary castles, to the finest place to grab a macaron, to booking your afternoon tea or a trip to The Butchart Gardens, our knowledgeable onboard attendants have got you covered. The Clipper fleet’s first upgrade since 1994, the new vessel’s larger size (the Clipper V is a whopping 38 feet longer than the previous Victoria Clippers!) makes cruising through the Salish Sea much smoother. The ship is also aided by a motion-dampening system and huge, bulbous bows that better pierce the waves and allow the ship to glide through rough seas. Since you aren’t allowed to visit the wheelhouse, here’s a chance to peek inside where all the “magic” happens while we’re underway. Wraparound windows and an instrument panel full of screens, dials, knobs and switches offer homage to travel’s romantic past and provide our captains with everything they need for a seamless journey. With no other vessel quite like the Victoria Clipper V in the region, traveling between Seattle and Victoria is an entirely unique experience. Hop onboard and see how we have elevated our vessel and service to the next level! Beautiful. I look forward to my next trip this Easter long w/e. Thanks Mary! We look forward to having you aboard with us! I have a walker and could not have asked for better care on and off the boat along with handling my baggage. I’m so glad to hear you had an excellent trip! We look forward to having onboard with us again soon. Don’t hesitate to reach out if you need help planning your next trip.